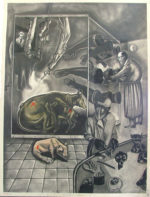 Sue Coe, It Got Away From Them (1990), graphite, watercolor and gouache on board, 40 1/8 x 30 inches. Copyright ©Sue Coe, Courtesy Galerie St. Etienne, New York. From an early age, Sue Coe has had a complicated relationship with meat. Growing up near a slaughterhouse in Liverpool, close enough to hear and smell its animal tenants, she became an animal activist and staunch vegan.2 It is no wonder, then, that she would be drawn to the vibrant, visceral paintings of Chaim Soutine (1893–1943), with their expressive, even empathetic depictions of animal carcasses. 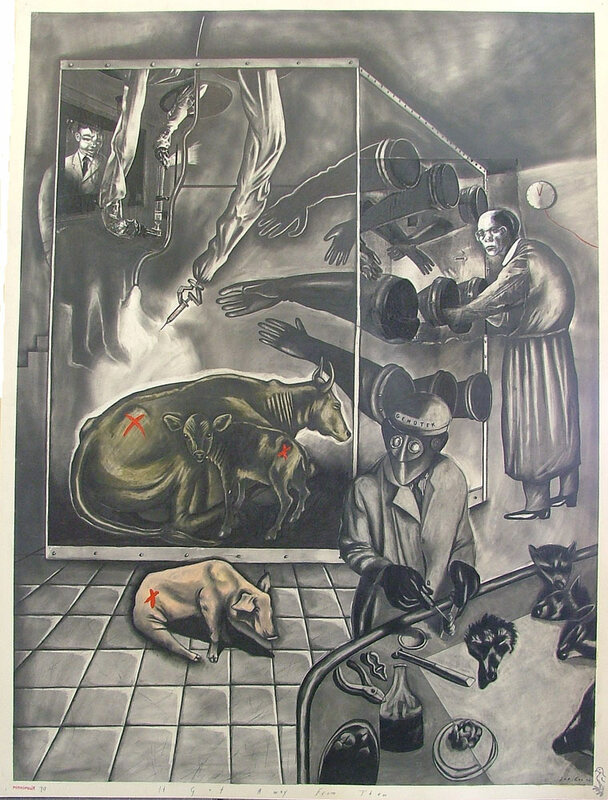 Coe has often cited Soutine as an inspiration, not for his painterly style, but for the intensity of his work and his understanding of the sacrificial nature of animal slaughter.3 Soutine’s account of witnessing a butcher’s delight in killing a chicken had a profound effect on Coe. Soutine described the silencing effect it had on him as a child, resulting in a cry of outrage that he spent the rest of his life attempting to utter. That feeling of stifled rage, curiosity and confusion is the driving force behind Coe’s work. She reckons with cruelty and struggles to reconcile a gut instinct to protect all life with acts of so-called justified violence.